Goring is located between Oxford and Reading and easily accessible from the M4 (J12) and M40 (J4, 5 or 6) motorways, by train and by car. The main festival marquee is located on the Cricket Field (Gardiner Recreation Ground), use postcode RG8 9BF for sat nav directions), which is in the centre of the village. 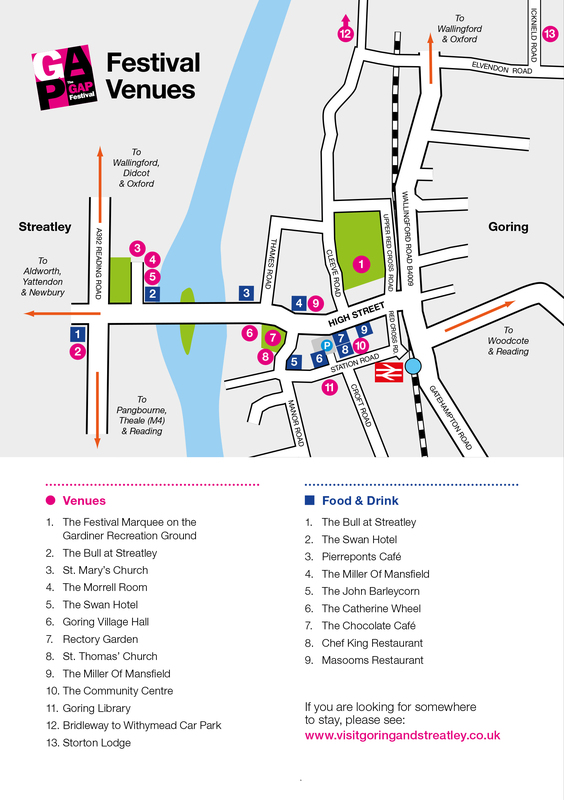 All other event locations are within walking distance of the marquee. Please note that some of these spaces have parking restrictions at certain times of the day. We would ask that you please observe these restrictions and not block any driveways. There is limited disabled parking located in the private Thames Court car park (entrance Cleeve Road, which will be managed by Festival staff). A managed drop-off point for people with mobility issues outside the main marquee entrance in Cleeve Road will also be provided. Please use postcode RG8 9BF for Sat Nav directions. Some of the public car parks listed above also have some disabled spaces.